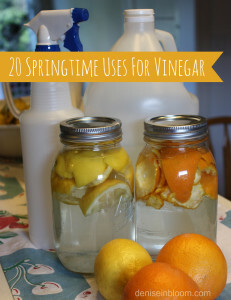 This is a great list of 20 Springtime Uses For Vinegar by Denise of deniseinbloom. These are her favorite ways of using vinegar in her home. She also includes a great recipe for an All Purpose Citrus Vinegar Cleaner. Cleans wooden cutting boards. Works as a great substitute for baking soda, making the boards clean and free of germs. Preserves flowers. Love cut flowers in the home? Add two tablespoons of vinegar and sugar to the water to help the flowers last longer. Pet odor remover. After bathing your pet, mix one cup of vinegar to two gallons of water and pour over dog, or do this instead of bathing too. Insect repellent. Vinegar is a safe and effective insect repellent, chasing away ants and other insects once you wash the counter tops with a vinegar solution. Click below to read all 20 uses for vinegar. There are some uses I’ve never heard before.